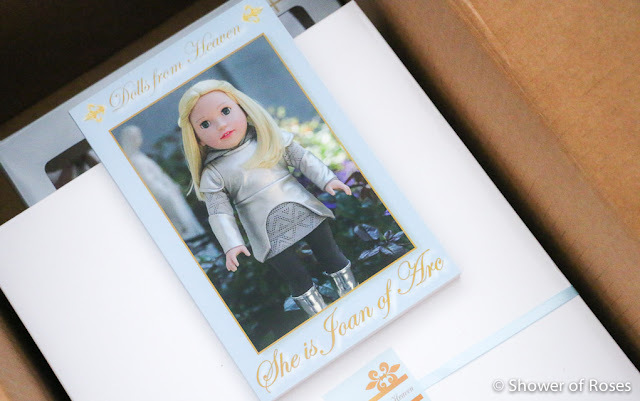 I have had this beautiful doll, from Dolls from Heaven, tucked away in my closet since last spring... 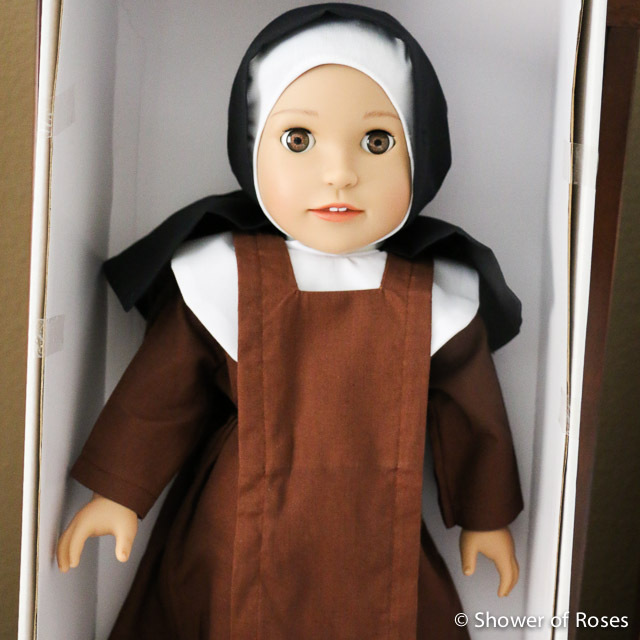 I've been dying to give her to our little Rose, and I almost did on the recent feast of St. Therese, but decided to continue saving her for either a birthday or Christmas gift this upcoming December. In the meantime, I've been meaning to share some photos with you all, along with a coupon code from Dolls from Heaven, one of my current sponsors here at Shower of Roses. Our girls already have quite the collection of American Girl dolls and I have refused to purchase any more... 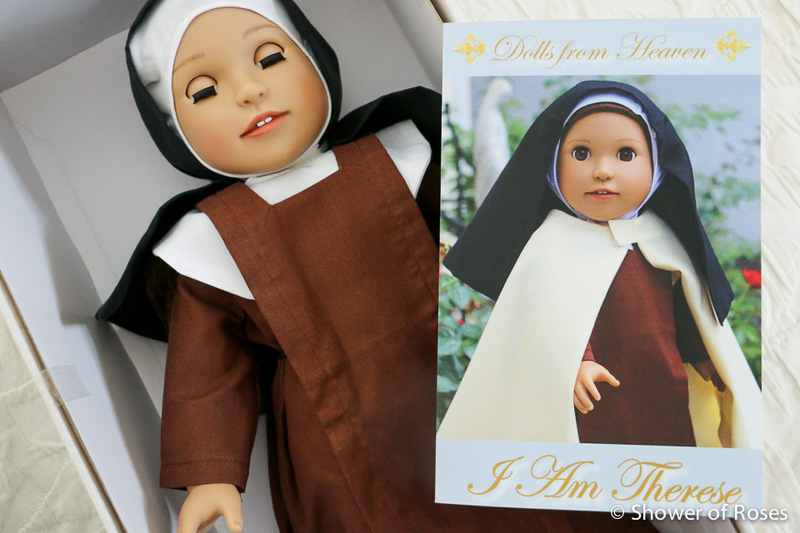 They also have beautiful Little Habits and Saint Costumes for their dolls as well. 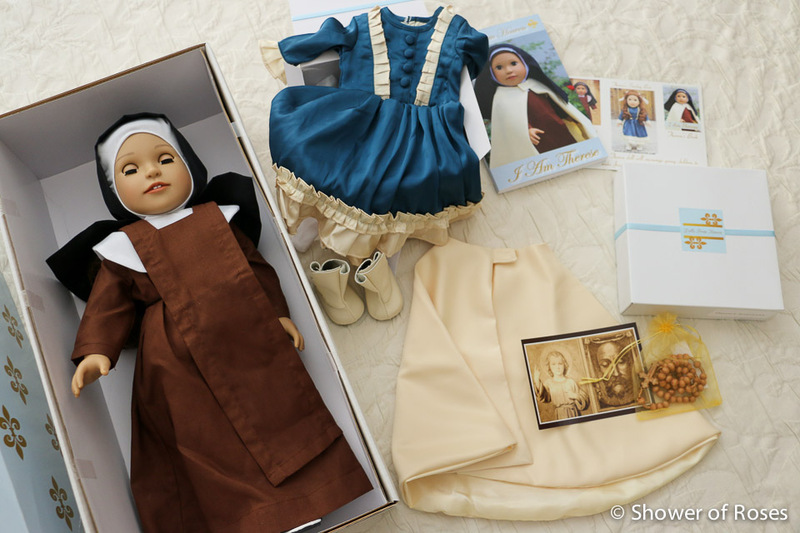 Nevertheless, this lovely St. Therese doll (made and sold by a Catholic company!) will be such a fun and inspiring addition to their collection! Since I'll be giving her as a gift later this year, I didn't take her completely out of the box, but she seems very similar to the girls' other dolls in both size and quality. She even comes with a book! 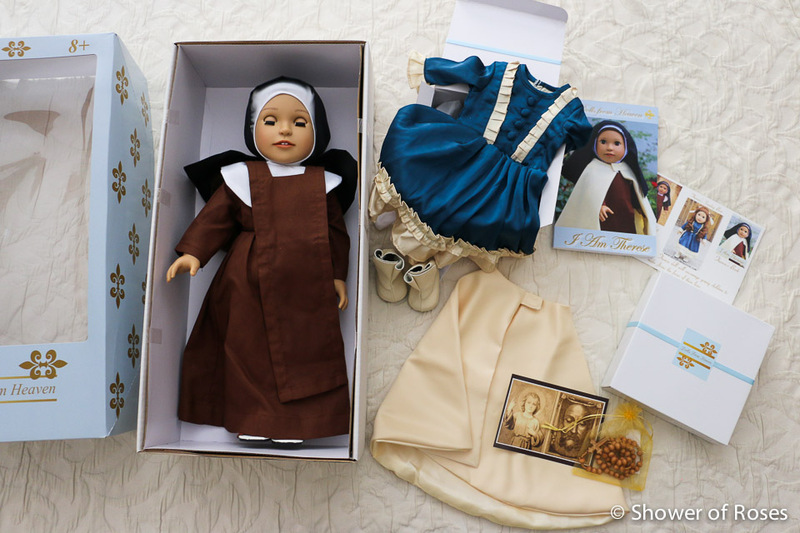 In addition to the Therese Doll and Book, Therese's Sunday Best and Therese's Accessories are also available. You can purchase everything together with a $5 discount here. 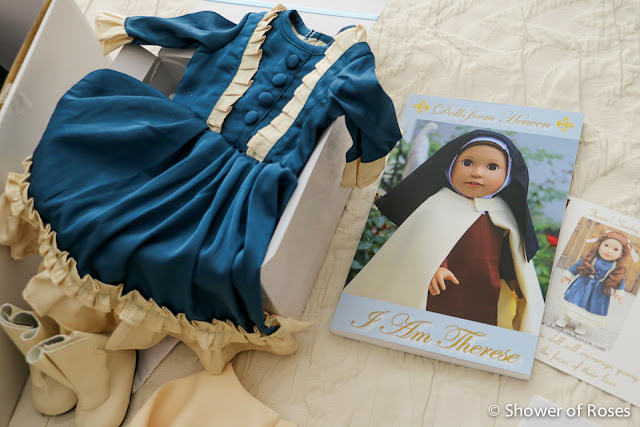 Therese's "Sunday Best" outfit is gorgeous! It comes with a Blue long- sleeved dress with cream ruffles, white stockings, cream boots, and a cream hair-bow. 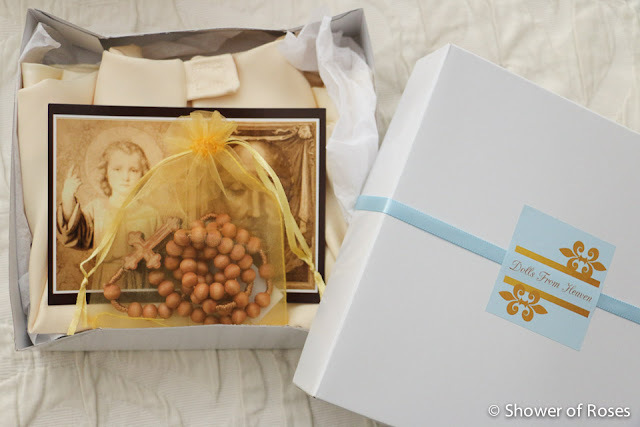 The smell of roses as I opened Therese's Accessories, coming from the brown rosary, was a wonderful surprise! 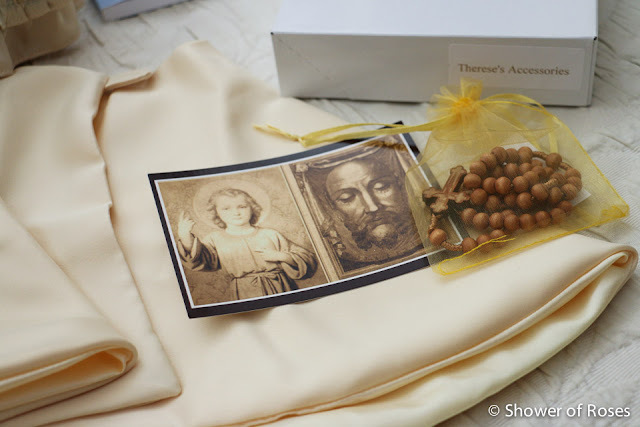 The accessories also come with a Carmelite mantle (cape) and a picture of Therese's Holy Face of Jesus and the Infant Jesus.